We Won Best Design at Premiere Settings Austin! In case you haven’t heard, Premiere Party Central held a design competition for Austin event planners at the Palmer Events Center recently. And it was kind of a big deal! 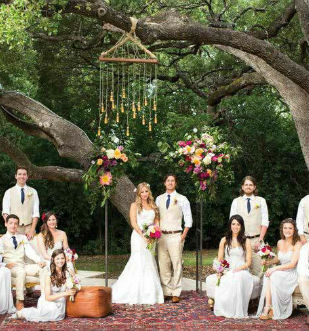 Premiere Events selected 12 of the top event planners in Austin to compete in a design competition. We were to incorporate their rental items and design a table around the theme “Chocolat”. Other than those guidelines, we were left to our own devices. The prize – $1,000 to the charity of our choice. I knew right away that I wanted to win this because I desperately wanted that thousand bucks to go to Restore A Voice, an organization that works to end human trafficking in Austin. We were lucky enough to snag Beth O’Reilly from The Flower Studio and we went right to work designing. I had an idea to build a “Chocolate Giving Tree” that appeared to simply grow straight through the table and have chocolate flowers growing from it, but had no idea is this was feasible at all. Enter Beth, who just happens to have a degree in sculpture – who knew?! What a great match we were, because she took my vision and brought it to life in ways that blew me away. When the project was complete and the judging began I stared at our completed design in awe. It looked exactly how I had envisioned it in my head! And this was the final product – amazing!! What a great table! It’s called a ghost table and it’s available for rent at Premiere Events. You may not realize it, but this amazing tree is nearly 9 feet tall! She also made these beautiful hand painted quote “cards” out of chocolate. Look closely – the chargers are actually chocolate too! Beth, from The Flower Studio, did an outstanding job on the base (trunk) of the tree. It was so realistic! It looks like we just uprooted it from the forest. The green tint that you’re seeing is from the beautiful uplighting provided by Intelligent Lighting Design. Thanks to Azulox Photography, we have these beautiful images to share with you.